Don’t panic – you can still have that handmade holiday or birthday, and do some stash busting while you’re at it! 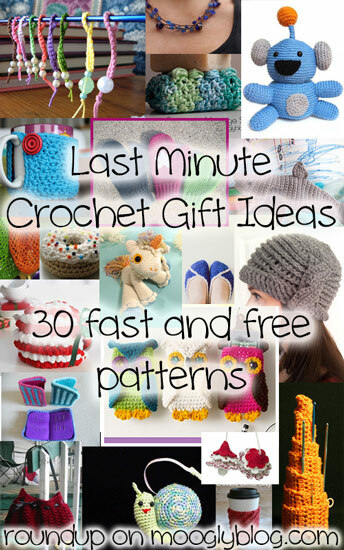 Here are some great last minute crochet gifts, each of which takes less than 200 yards of yarn! 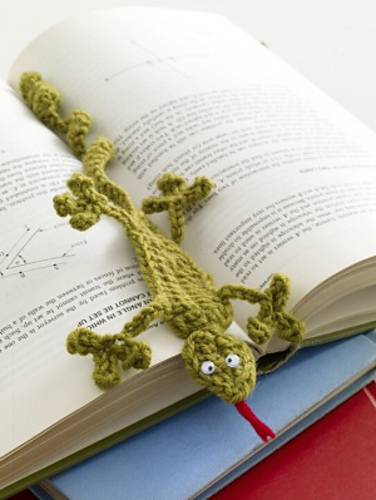 Sparky the Monster by Stacey Trock, for Knitting Fever: There are all sorts of monsters here to make, and they are all adorable. But I have to admit Sparky is my favorite! 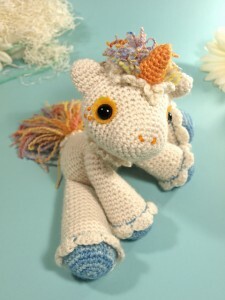 Hermione the Unicorn by Dawn Toussaint, a Ravelry download: How cute is this!? I know so many little girls who would treasure their very own handmade unicorn. 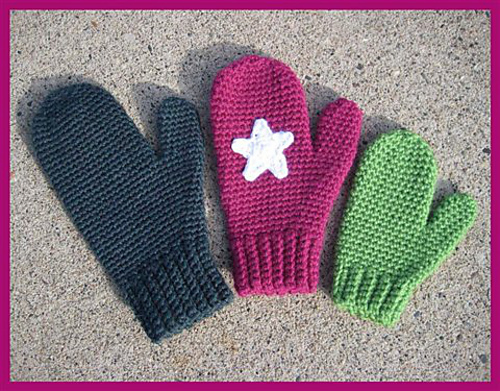 Mrs. Murdock’s Mittens by Brenda K. B. Anderson, on Crochet Me: Simple stitches and a classic shape make this a quick crochet project in any of the three size! 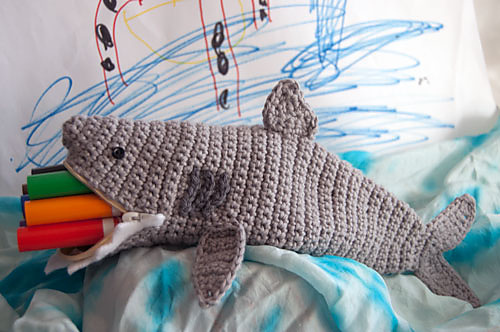 Shark Time Pouch on Moogly: This is one of my most popular patterns, and it takes only about 100 yards of yarn! Gecko Book Mark by Lion Brand Yarn: Pair it with a great book for a fantastic gift. Owl Cell Phone Cozy by Linda Cyr, on Craft Yarn Council: Just 75 yards of yarn and a button make this clever cozy! Dragon Egg by Susan Gater, a Ravelry download: A great pouch or dice bag – great for gamers as well as fans of Game of Thrones. Easy Listening Ear Bud Covers on Moogly: Teens love listening to their electronics, but you don’t have to love hearing it! 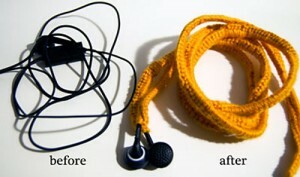 Use plastic lacing for a tough cover that wipes clean! 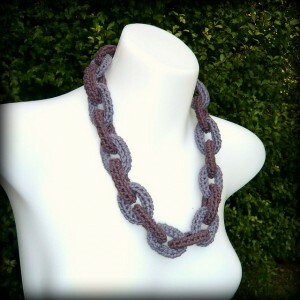 Crochet Chain Link Necklace by Shara Lambeth, on Shara Lambeth Designs: Such fun! I can see both guys and girls going for this tongue in cheek piece. Treble Sponge by Anastacia Zittel, on Anastacia Knits Designs: Make cleanup just a little more fun – and it takes only 20 yards of yarn! This pattern is bringing up a malware warning! 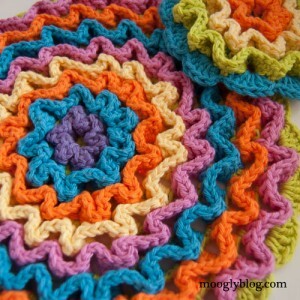 So please try one of the fab dishcloth patterns here on Moogly, such as the Basketweave Scrubby Cloth, Ripple Puff Cleaning Cloth, or Rainbow Flower Scrubby Dishcloth! Crochet Flower Hot Pad on FreeCraft Unlimited: I’ve made one of these myself – super fun and fast project! 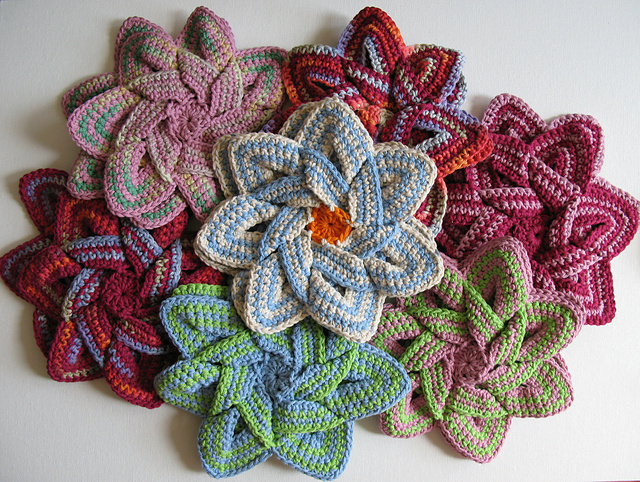 Wiggle It Crochet Trivet on Moogly: The table blooms with flowers (and delicious food) when you use these trivets! 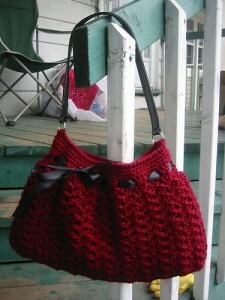 Crochet Grocery Bag by Haley Waxberg, on Knit-O-Matic Yarns: Scroll down to find this fast and easy pattern. Great for any eco-friendly people on your list! 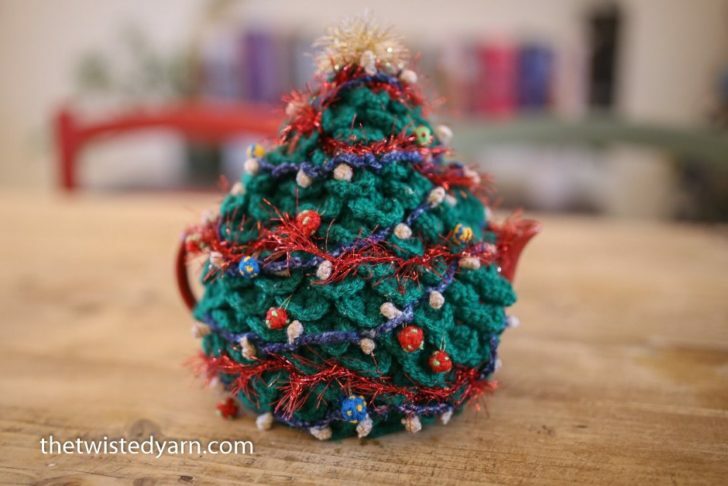 Christmas Crochet Teapot Pattern by Twisted Yarn: How festive is this?! 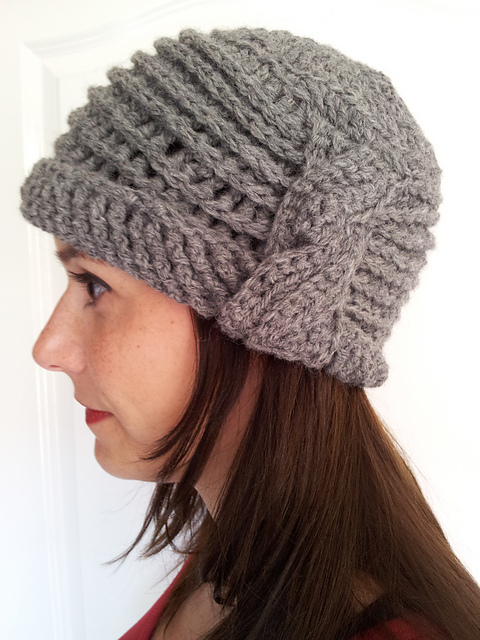 Boutique Ribbed Cable Cloche by Guinevere Parisi, a Ravelry Download: This hat has a great vintage look. Nordstrom Crochet Hobo Bag by Dao Lam, on Just One More Line: I’ve made this pattern myself – it works up very fast, and looks great! Artfully Simple Infinity Scarf on Moogly: This pattern has been out for less than two weeks but it’s already one of my top patterns. People are reporting making them in less than two hours! 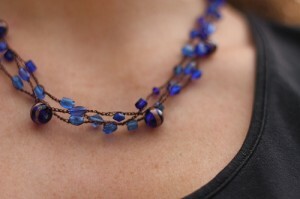 Crochet Beaded Necklace by Devon Clement, on Notes from the Something: This detailed tutorial teaches you to make beaded necklaces using very basic stitches. I’ve been meaning to try this! 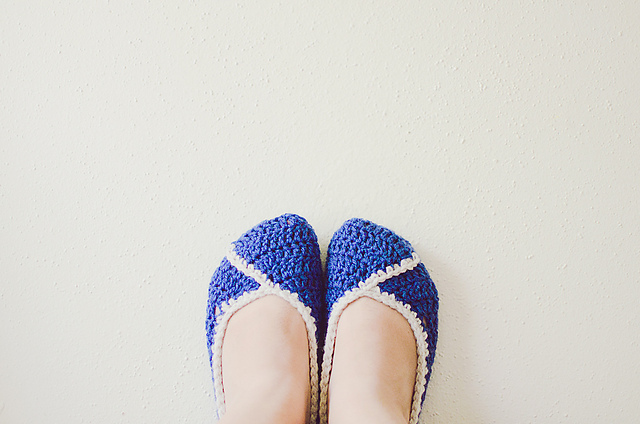 Lizzie by Lisa Gutierrez, on GoodKnits: These little slippers are super fashion forward, and great to slip in a pouch for when those high heels are just too much to take any more. And much more stylish than stocking feet when everyone has to remove their snow boots! Crooked Coffee Cozy by Danyel Pink, on CrazySocks Crochet Blog: This is a great beginner pattern, and a great way to wrap up a gift card for their favorite coffee shop. 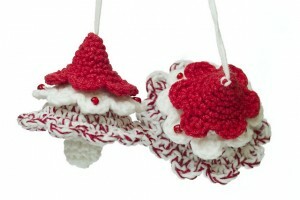 Little Christmas Tree by Iga Pączek, on Tako-san: These are adorable and take just 40 yards of yarn! A great way to spread some cheer and stash bust those odds and ends! Pampering Massage Soap Saver on Moogly: Pair it with a bar of locally made soap or one of the goodies from Bean Tree Soap! 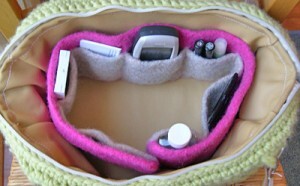 Felted Purse Organizer by Josephine Woo, on Little Projects: This is so smart! For everyone who loves being organized – or could get a little more so! 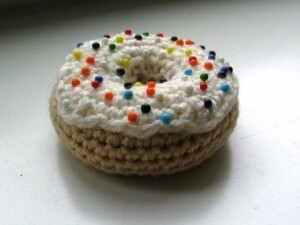 Donut Pincushion by Nevadamama, on Crochetville: So fun, and zero calories! 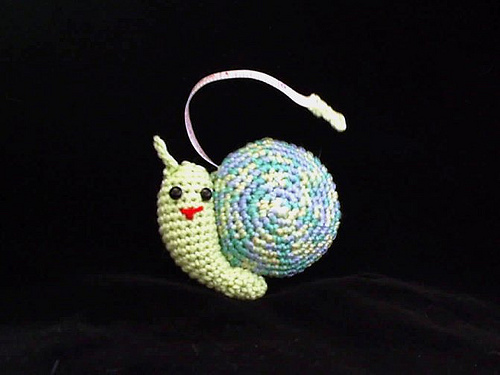 Snail Tape Measure by Karen Null, on Karen’s Knittin’ Crap: Love this! A tape measure is a must for any crafter, and this one is sure to be treasured. Crochet Needle Case by Karen Janine, on Mitten and Makings: Very cute, very handy, very little yarn and very fast to make! Tower of Babel Hook Stand by Eleanor Howe, a Ravelry download: A great way for them to show off their hook collection! Simply Crocheted Stitch Markers by Pickle Soup, a Ravelry Download: Make them as is for knitting stitch markers, or add a lobster claw clasp to the loop for crochet stitch markers! Do you start your crochet gift crafting ahead of time, or do you hook right up to the last minute? What’s your go-to gift when you need something fast? This year mine is the Tasty Little Chevron Bag. Share your ideas in the comments! 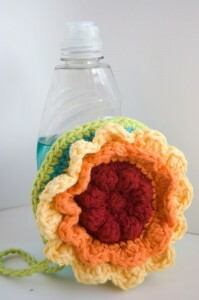 OHH some really fun little projects here! 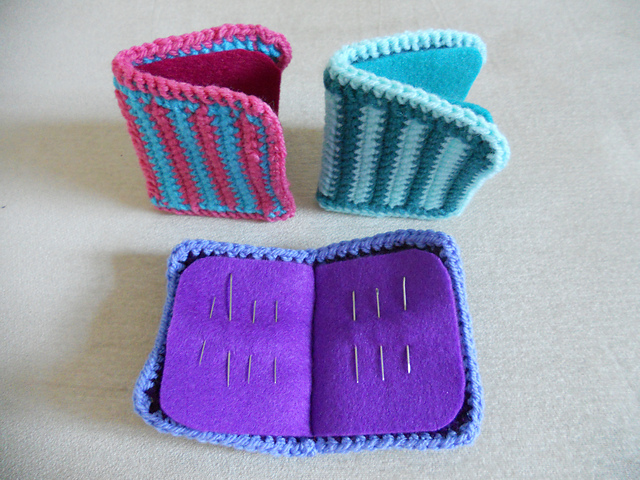 I’m bookmarking them now and hope to fit in a couple more small projects before Christmas! Thanks for this round up of great ideas! Thanks once again for an awesome compilation! 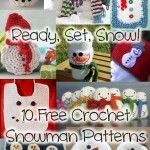 You've got a great idea to make some list of quick and easy patterns for gifts! I'm gonna make some things myself, but in next year (assuming the world won't end this Friday). Thank you so much for all you do. Love your site. Have a happy holiday season. Thank you so much. the patterns are great which you posted. Thanks for saying so lien! 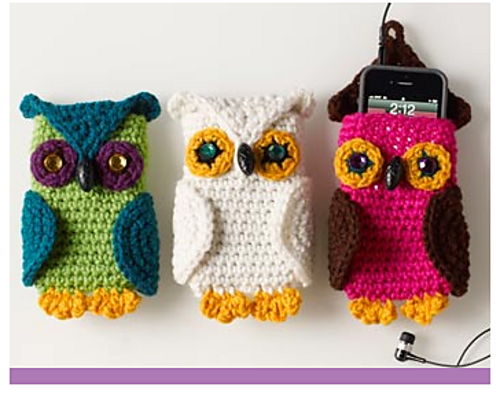 this is seriously enough to astonish a person with a LOUD VOICE!..they are knitted sooo beautifully!..keep it up TAMARA ♥..
please email the crochet pattern for the grocery bag, couldn’t get it to print out. Thank you very much. Hi Margaret! 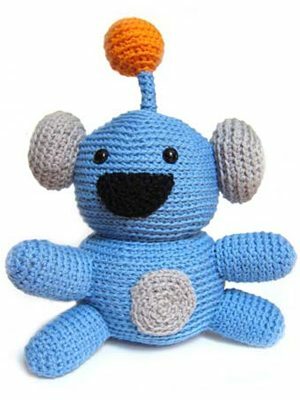 That would be a violation of copyright, since I don’t own the pattern, but you can contact the owner of that site at [email protected] and she should be able to help you. 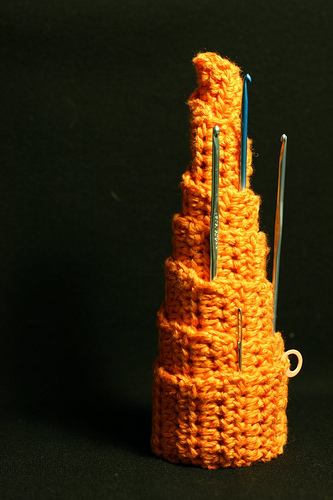 Hey Tamara, I know this post is over a year old, but I think under the cc license on knitomatic’s pattern, it’s okay to redistribute the pattern for as long as you don’t alter it. Thanks so much for all these ideas. Im going to be hookin’ like mad up until Christmas! Lovely and cute. Thank you very much! I learned to crochet in july this year. I’ve made about 11 hats and an advent calender. 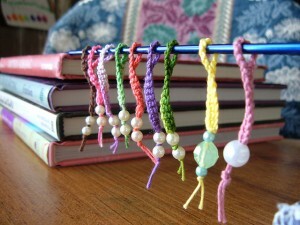 Ive also made a few of these projects already! I am excited about trying the jewellery. 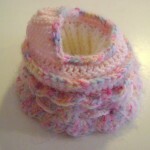 I hope to start in the new year making a basket of christmas gifts to put away and for birthdays through the year. Huge thanks to you and other lovely crafters putting great crochet patterns online for folks like me to use. Thanks Diane! Sounds like you’re off to an amazing start! 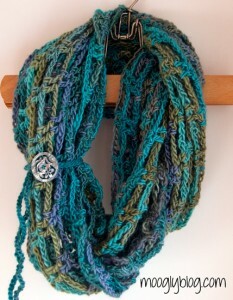 I’ve been whipping up a bunch of the sundance slouchy hats. The picture doesn’t do the st pattern justice. It’s gorgeous and everyone loves it! Hi Tamara — I was looking for the coffee cozy pattern, as I was just finishing up a few of these today and thought I’d print out the pattern. Sadly, the link no longer works — message is that the blog has moved. Do you by chance have a new address for her? Also, As I was looking for the pattern on your site, I had to scroll through all the pattern roundups, because I never found a search your site place. Did I miss it? Thanks again for your great site. 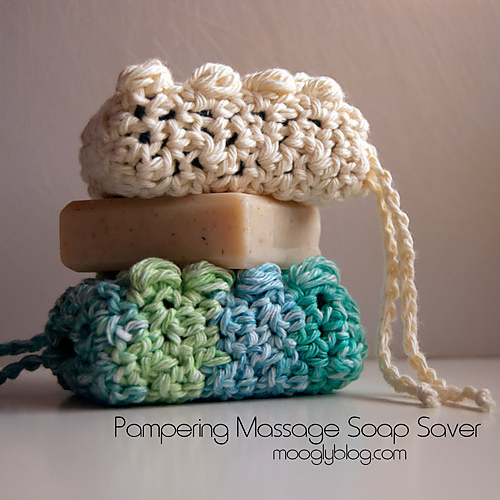 I just made up 8 soap savers today, to trade with my local soap lady. Will post some photos — you probably already knew this, but if you alternate colors on it, you end up with a great houndstooth pattern. Love it. I am actually making several more in girly colors to give as “purses” to the girls at my soon to be 6 years old’s birthday tea party. 😀 Glad you’re enjoying the soap savers! We don’t have a search bar – it got lost and forgotten when we switched themes. Hoping to get one up as soon as we’re well enough to tackle the coding – it’s been trickier than anticipated to find one that fits the site! For now I recommend typing “moogly topic x” into google to search for the desired roundup. Some lovely ideas, I am thinking of starting a few for Christmas already. Thanks so much for sharing this, I have spent the last 2 days making the unicorn for my niece’s birthday and it has turned out so great! Oh fantastic! 😀 So glad to hear it Helen! hi Tamara! I was wondering about the nordstrom purse pattern; where did you buy the leather handle? Just an FYI that the teen slouchy hat pattern isn’t a free pattern. 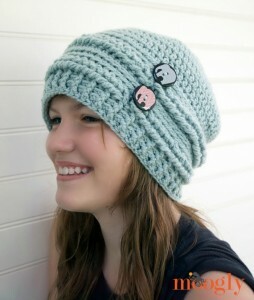 I can’t find the link for the slouchy teen hat? Name? 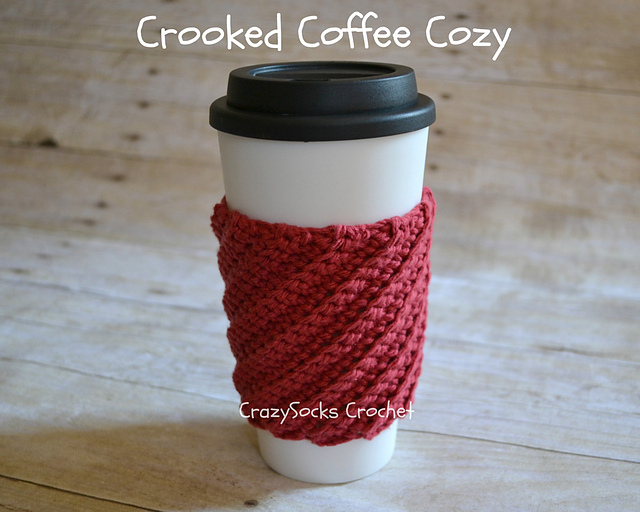 That one is on Simply Collectible Crochet, I believe, be sure to scroll all the way to the bottom of the post to get the pattern! Hi, There is no hyperlink to the slouchy hat – number 1 under Crochet Gifts for Teens. 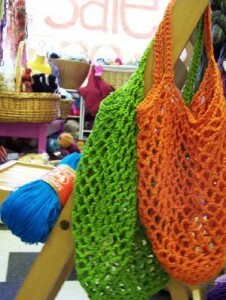 I looked on the Simply Collectible Crochet website but cannot find the same hat. Could you please add a link as I would like to try the hat. Thanks. Oh how strange! Thank you for letting me know Elaine, I’ll fix it right now! I am broke this year but have lots of yarn so I am making presents for my whole family. However, my 12-year-old brother is proving to be a challenge. Do you happen to know of anything like these that would interest him? He likes Harry Potter, Percy Jackson, and Star Wars in particular. Thank you so much! I think I will make him one of the R2D2 hats. Thank you for these great patterns! really love these patterns, so nice for a beginner as i am thanks!! Thanks Susan, I’m so glad you like them! 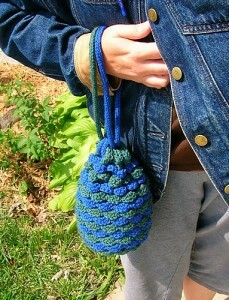 Where can I find the pattern for the “Crochet Grocery Bag”? 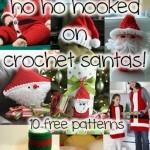 I love all the crochet ideas! I am working on some little projects of my on. 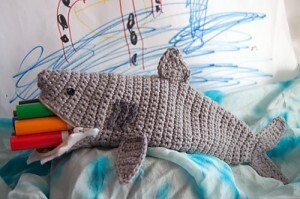 I hope you have more crochet patterns to share. Hi! 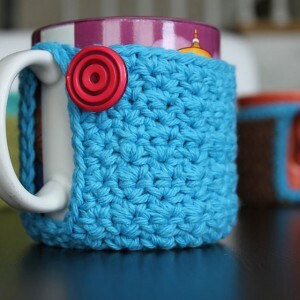 I’ve been looking for the tea cozy pattern forever! Your link takes me to Bernat but they don’t have the pattern on their site anymore. 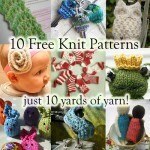 I’ve got the yarn but no pattern! Any chance you might know of any other way to get this pattern? Thanks! Hi Jamie! Thank you for bringing this to my attention! Unfortunately, Bernat has removed this pattern from the internet. I even tried the internet archive but it’s not there either. I’m sorry I wasn’t able to find it! Perhaps an appeal to Yarnspirations Customer Service?